The California Transportation Plan 2040 [PDF], currently in draft form, officially recognizes what many have been saying for a long time: the state cannot keep building highways, and its residents cannot keep driving as much as they do now, if California is going to reach its own climate change goals. 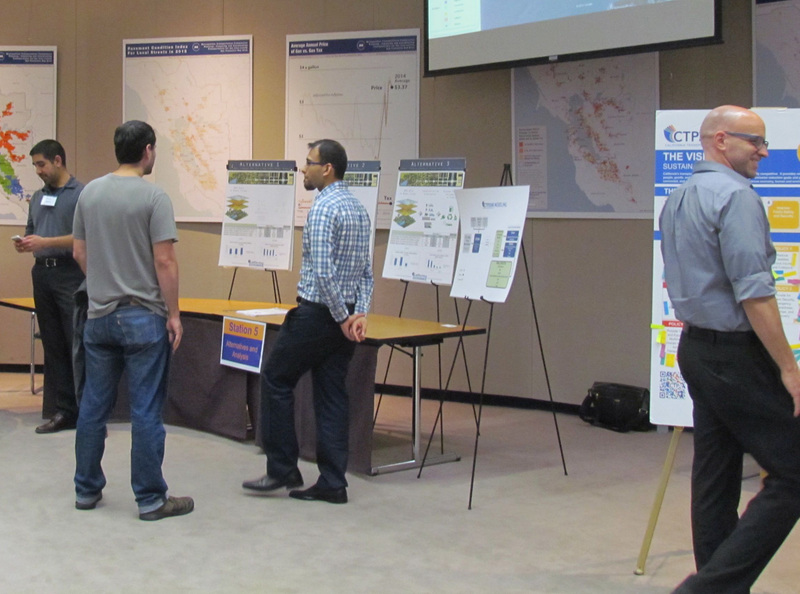 A recent workshop in Oakland presented the California Transportation Plan 2040 to all interested parties. 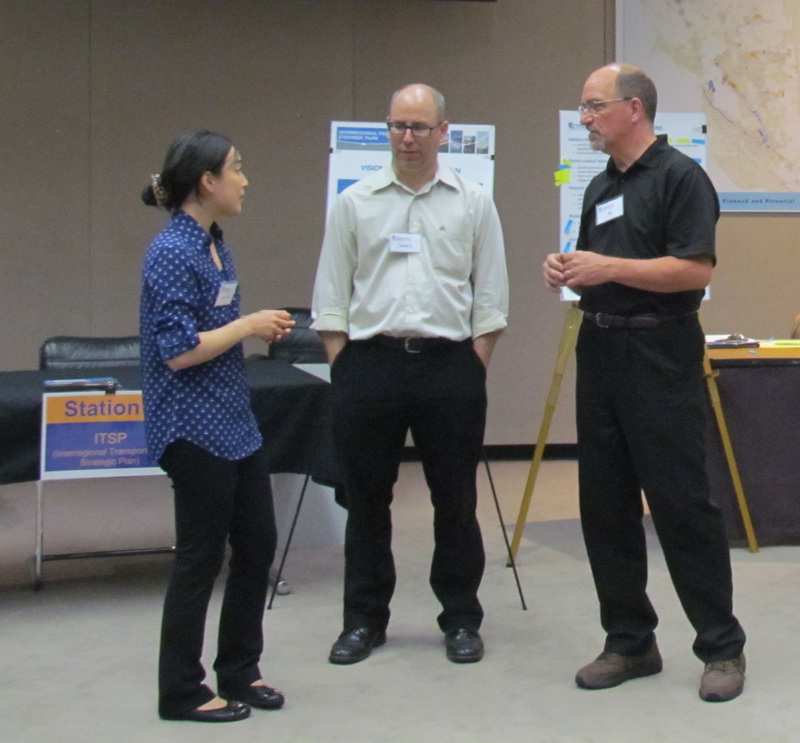 Caltrans is currently in the process of gathering public input on its update to the statewide long-range transportation plan, which lays out state priorities and goals for transportation, and suggest ways of reaching them. Like many state planning documents, it’s big, somewhat vague, contains no specific projects, and covers a lot of ground. Yet it could be the plan that changes the way California builds its transportation system. That is, if it gets support from those who see its potential, and if it doesn’t get put away on a shelf somewhere and forgotten. What makes this plan different from previous statewide transportation plans is that it is the first one completed under S.B. 391, which requires it to estimate the greenhouse gas emissions of elements in the plan. In doing so, the document spells out what many people don’t want to hear: that California, often considered a leader in climate change efforts, will fall far short of its climate change goals if it keeps building and widening highways, encouraging Californians to continue driving cars the way they do now. The CTP analyzed three progressively more ambitious scenarios to measure how effectively they meet state climate goals. Only the third one makes it. Scenario 1 incorporates all of the current state and regional transportation plans, including adopted Sustainable Communities Strategies plus statewide aviation, freight, rail, and transit plans. Scenario 2 assumes everything in the first scenario, plus a host of other suggested recommendations including road pricing, increasing carpooling and car sharing, better and more transit, doubling bike and pedestrian mode shares, increasing the number of HOV lanes and changing carpool requirements to three or more people statewide, and various operational efficiency measures from other state plans. Scenario 3 assumes everything in the first two scenarios, plus converting almost the entire fleet of vehicles in California to zero- and low-emission, fuel-efficient vehicles. Only with the third, most ambitious, scenario will California be able to reach its greenhouse gas emission reduction goals, according to the calculations in the plan. 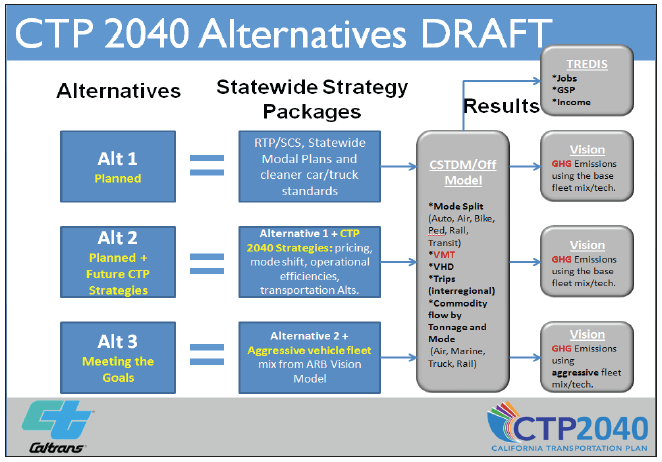 The current draft of the California Transportation Plan 2040 (CTP) is the culmination of several years of meetings with regional and state agencies and input from seven statewide focus groups [PDF] representing a diverse group of California residents. Comments on the plan are due before April 17 and can be made here. After incorporating comments and making any necessary adjustments, the team will recalculate its results for a final draft due to the legislature in December 2015. Goals in the plan include improving mobility for everyone, preserving the multimodal system, supporting a vibrant economy, improving public safety, fostering healthy communities and social equity, and practicing environmental stewardship. For each goal, a set of general policies has been proposed, and each of those policies in turn are supported by specific strategies and performance measures. “What we see is going to get us [to those goals] is a major mode change, with fewer single occupancy vehicles, and major changes in vehicle technology,” he said. A list of recommended actions included in Chapter 8 of the plan stem from the goals and strategies. Not included among them is “widen highways to reduce congestion,” which is still the most popular way cities and counties–and Caltrans–currently deal with transportation problems. David Schonbrunn, President of Transportation Solutions Defense and Education Fund, is enthusiastic about the plan. While the CTP itself won’t change anything, the fact that it’s been proposed as the state’s formal strategy is important. There are other potential game-changing aspects of the CTP as well. “With the CTP, Caltrans has the opportunity to be a leader,” said Jeanie Ward-Waller, Senior California Policy Manager for Safe Routes to School National Partnership. The department, she says, could do much more than just amalgamate regional plans into a bigger package. “Caltrans could go much farther, in a larger role, saying ‘this is how the state is going to reach its goals.’ Given how Caltrans is trying to reform, this is a key opportunity for them to champion this plan and take a lead in implementing it,” she added. Safe Routes to Schools is a member of Climate Plan, a coalition of groups working together to support climate change policy in the state. The coalition plans to submit comments on ways to improve the plan’s recommendations. “We would like them to be clear and actionable,” said Ward-Waller. “The CTP should lay out specifically what goals we want to reach, and say how we’re going to get there,” she said. Among Climate Plan’s recommendations are to update the assumptions in the plan–which are already out of date in terms of rapidly changing technology as well as recently updated regional plans, to consider equity effects on disadvantaged communities of the various strategies, and to align transportation decisions with funding. There may be road bumps ahead for the plan, which is likely to cause some consternation among agencies focused on trying to relieve congestion by building more road capacity. Because it is in draft form, changes may yet be made that soften its conclusions, so public support and comments are vital at this stage. Comments, due by April 17, can be submitted via an online comment form here. Reading over the documents provided (thank you Melanie for the links) sounds encouraging toward a transition away from cars to an active-transportation based commute. How the metrics are put into action will be truth-telling in the future to come. Further, how well the local municipalities engage with the public (outreach, marketing,etc.) to motivate a more active transportation based commute will become increasingly apparent as well. Hopefully, the ‘old way’ of thinking is rapidly replaced with one that is far-removed from a ‘car-centric’ state. Investing more in public transit is promising. The greatest problem lies (in my opinion) in increasing the ridership — which is embedded in the public not being informed of the reach available by a blended commute (walking, biking, train, buses). People simply are not aware of the reach of public transit. That needs to be changed. Possibly by better communications through outreach, education through a possible ‘app’ development? One of the most promising aspects of this discussion is that the state of California has a large (extremely large) opportunity for growth. Imagine motivating a large percentage of Southern California to engage in active transportation more frequently. That would set an example for the rest of the nation. We have the weather. We just need the action on everyones part. Lets go. This can only have an effect if the developers and downtown interests get involved and coordinate where people will live, work and go to school. In fact, the same efforts that would reduce GHG emissions would probably go a long way toward reducing water use. Caltrans already has a “Complete Streets Program.” But the department too often makes moving vehicles a priority over safe and attractive infrastructure for people not sitting in a car.